Averaging 1,400 ft deep, the Linville Gorge was carved by the Linville River on its way down the Blue Ridge Escarpment from the High Country. One of the deepest gorges in the East, it also represents a great opportunity for outdoor recreation, boasting many miles of trails. View across Linville Gorge from the upper section of the Pinch-In Trail. The Linville River begins its course high on Grandfather Mountain, upstream from the main gorge area, before winding across the High Country plateau, and then pouring over Linville Falls for a dramatic start to its rough run down the gorge section. The Gorge is rugged terrain. After descending about 1800 feet, the river finally runs past Shortoff Mountain and into Lake James for a quiet end to its dramatic journey out of the mountains. 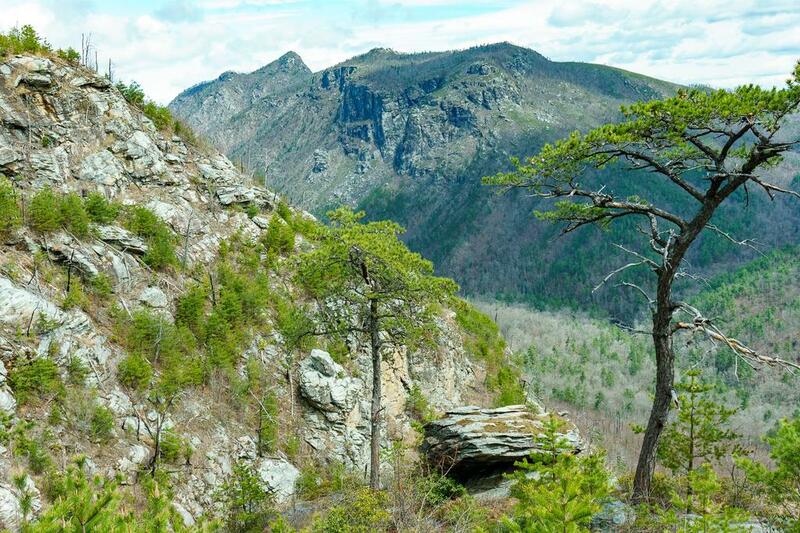 Many trails are within the Linville Gorge Wildeness Area, which lies on either side of the Linville River, encompassing the river bottoms and steep slopes, cliffs, and up to the mountaintops on either side. Other trails are just outside the Wilderness boundaries on surrounding National Forest land. Hiking trails in the Gorge generally start along one of two long, gravel forest service roads on either rim. Hikes into the gorge tend to climb or descend this distance and those within the gorge have to contend with crossings of the river itself, making most hiking in the area strenuous. However, several easier hikes lie along the rim and afford spectacular views of the river far below. 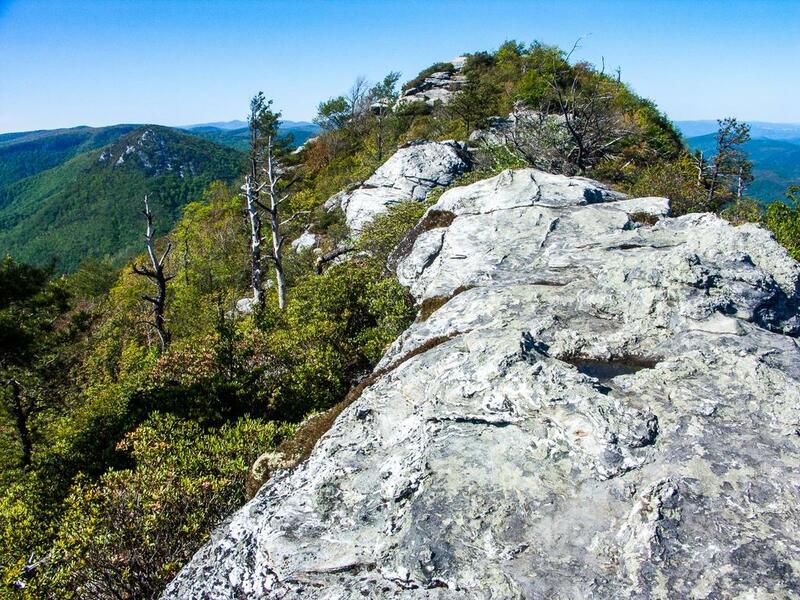 See the Linville Gorge Trail page for the full listing. Linville Falls sits at the head of the gorge on National Park lands associated with the Blue Ridge Parkway, so it has its own separate trailhead listing. The blackend trunks of pines, like spent matchsticks stuck in the adjacent drainage, remind hikers of the fires that created most of the views along this trail. Within its nearly 12,000 acres of hardwood and pine forests, you'll find an array of wildlife and forest types not uncommon to the middle elevations of the Appalachian mountains in the gorge. However, fire has played a greater role in the forest community here recently, with much of the gorge having burned intensely within the last 10-15 years, and it is very noticeable. Before that time, fires were generally suppressed for the previous half-century. Much of the Linville Gorge area has what is known as a fire-adapted forest, which historically saw a low-intensity fire once every decade or so. But suppressing wildfires allowed pines and other forest trees to grow more densely than they would with periodic wildfire, making the recent fires worse once they got started. In addition to the fires, dense growth of pines allowed vast areas of them to be quickly overtaken by native Southern Pine Beetles once a round of them got started in the late 90's. This led to the death of many pine trees that went up in flames once the fires started soon thereafter. 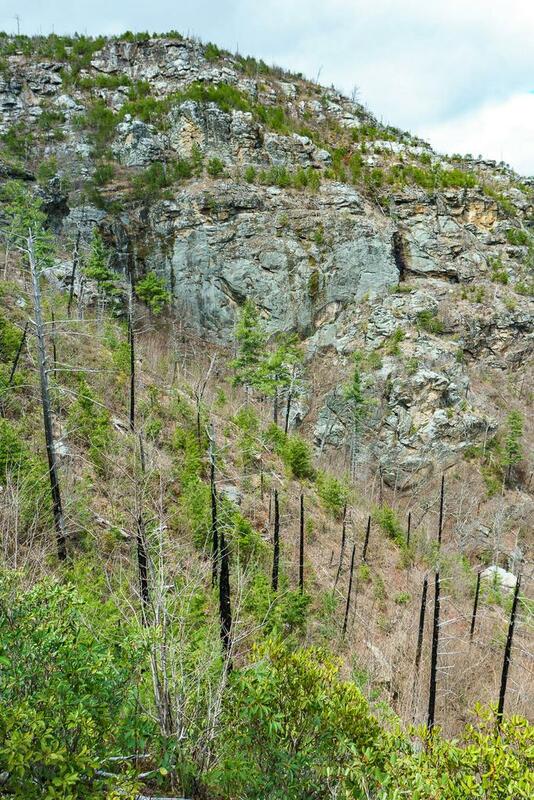 Adding insult to injury, the Hemlock Woolly Adelgid infestation which started around 2007 has wiped out most of the mature hemlock in the areas that didn't burn. The recent burns and insect infestations have cleared large areas of the forest, allowing fire-dependent and early successional species - wildflowers such as asters and trees such as Pitch and Table Mountain Pines - to begin a new cycle of growth. But in addition to opening up the views, return of wildfire should result in a healthier forest in the future, especially if low-intensity fires are periodically allowed to burn in the years to come. 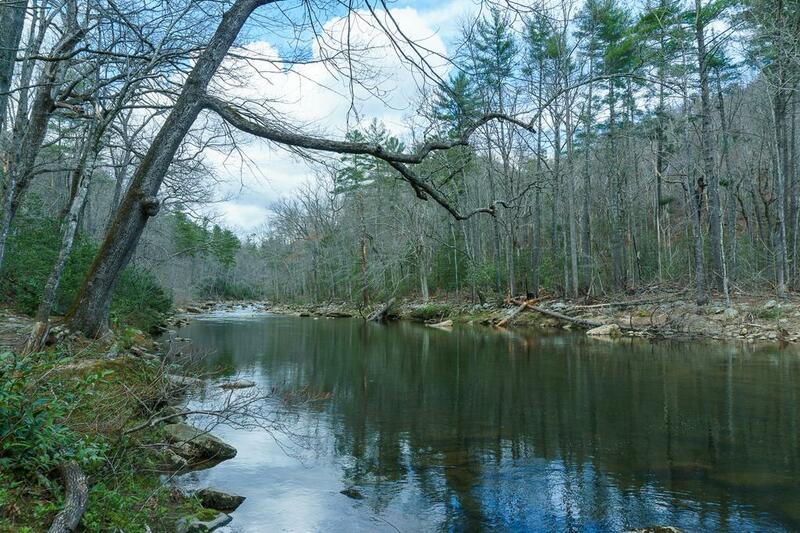 Outside the fire-affected pine forests, rich cove and other more typical mixed hardwood forests thrive in areas along the Linville River and in side coves where other streams join the river and are less prone to fire. Beautiful stands of uncommon Carolina Hemlock fight off adelgids on the gorge rim. White Pine, American Beech, and various kinds of Oak tower over the river and its rapids. And some of the highest summits support heath balds and nearly bare rock outcrops with low shrub communities, to round out an incredibly diverse living landscape within and near the gorge. View north up the Linville River, from a nice campsite just north of the Pinch-In and Linville River trail junction. 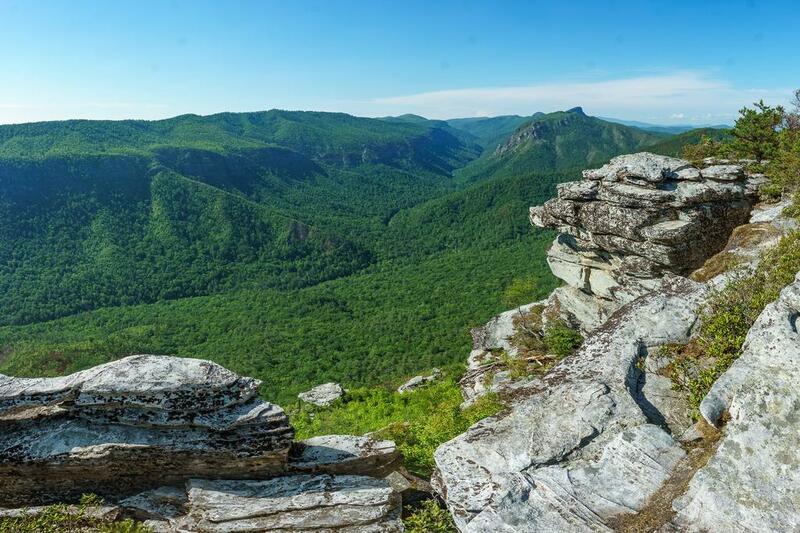 There are no developed campgrounds in Linville Gorge itself, since it is a wilderness area. Backcountry camping in Linville Gorge is allowed as in most National Forest areas, except that permits are required for weekends and holidays between March 1 and October 31. You can pick up a permit at the Grandfather district ranger office in Marion, or at the Information Cabin on Kistler Memorial "Highway" (a rough gravel road on the northeast side of the gorge). Developed camping is available nearby at the Linville Falls campground on the Blue Ridge Parkway, and there are many private campgrounds within a short drive. Lodging is available in the nearby towns of Morganton and Marion, with vacation rentals aplenty in the nearby High Country villages such as Spruce Pine, Little Switzerland, Linville Falls, and Newland.